The successive feeding activity of fleas on dogs frequently elicits a hypersensitivity skin disorder known as flea allergy dermatitis (FAD) or flea bite hypersensitivity. Treatment of dogs with Advantage II for dogs rapidly kills fleas within 12 hours which may reduce the incidence of this condition. 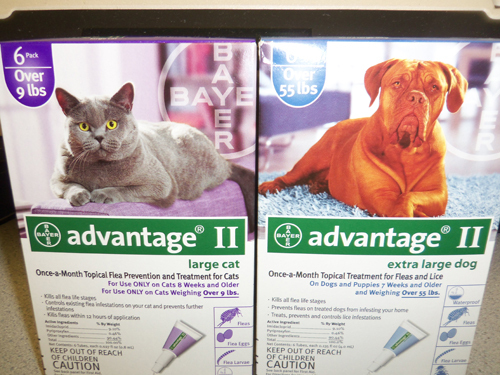 Advantage II for dogs kills existing fleas on dogs within 12 hours. Reinfesting fleas are killed within 2 hours with protection against further flea infestation lasting for four (4) weeks. Pre-existing pupae in the environment may continue to emerge for six (6) weeks or longer depending upon the climatic conditions. Fleas, flea eggs, and flea larvae in the dog's environment are killed following contact with an Advantage II for dogs treated dog. Advantage II for dogs provides multi-stage flea control effectively breaking all flea life-cycle stages for quick and lasting control of flea populations. Advantage II for dogs kills adult fleas quickly within 12 hours, inhibits the development of immature flea life stages and prevents them from reaching the biting adult stage. Advantage II for dogs kills chewing lice that infest dogs and puppies, and prevents further infestations. A Pet Place of Clearwater uses Advantage products as part of our routine Vetenary Services to benfeit your Pets overall Health.